Attorney Peter L. Paull, Jr.
Attorney Peter L. Paull, Jr. is a graduate of Colgate University and the University of Virginia Law School. He is admitted to practice in Massachusetts, Connecticut and Virginia. 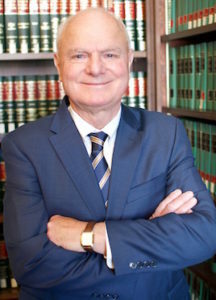 Attorney Paull has practiced in New Bedford since 1970, where he served as an Assistant District Attorney for the Southern District of Massachusetts. He became Of Counsel to the Firm in 2018. Attorney Paull has over four decades of experience in the Probate Courts of Massachusetts. He counsels corporate and individual fiduciaries who serve as Personal Representatives of Estates and Trustees of Trusts and serves as a Fiduciary and Counsel in the administration of complex estates with novel issues. He has been appointed by the Probate Court to serve as a Special Administrator in contested probate cases. He counsels clients with estate planning, particularly with regard to estate tax issues. Attorney Paull appears before the Massachusetts Appellate Tax Board in Boston on behalf of clients who wish to appeal real estate tax valuations by local Boards of Assessors or clients who have issues with regard to Domicile for Income Tax purposes. He has represented and befriended approximately 40 Veterans, the majority of whom were on a pro bono basis. Attorney Paull has an active conveyancing practice and is a Land Court Title Examiner. He has represented over 40 different residential lenders throughout Massachusetts as well as individual sellers, buyers and investors in real estate. Attorney Paull is a retired Commander in the US Naval Reserve with 21 years of service. He was awarded Veteran of the Year for Southeastern Massachusetts in 2015. He has been certified by the Judge Advocate General of the Navy. He served as the President and a Director of the Samaritans.